Made from high-grade alloy steel and hardened to 60 Rockwell “C”. Stepped plates support pushrod closer o rocker, stabilizing pushrods. Set of 8. Valve Spring Locators and Valve Spring Seat Cups provide a hardened barrier between the valve springs and aluminum heads, positively locating the base of the spring to prevent unwanted spring movement. For use in engines with or without hardened steel guideplates. Manufactured from case-hardened tubing with a surface hardening and welded ends for maximum durability. 5/16” in diameter, except for #9605, #9635 and #9654 which are 3/8” in diameter. Sold in sets of 16. For use in engines with or without hardened steel guideplates. Manufactured from case-hardened tubing with a surface hardening and welded ends for maximum durability. 5/16” in diameter, except for #9605, #9635 and #9654 which are 3/8” in diameter. Sold in singles unless noted otherwise. Manufactured by ARP, Edelbrock Head Bolt Kits contain a complete set of the highest quality head bolts and hardened washers available. Cold-formed to ensure molecular integrity and heat treated prior to thread rolling and machining. Reduced diameter bolt heads eliminate the need for valvetrain removal to facilitate cylinder head re-torquing. Hardened and parallel-ground washers are included. Rated at 170,000 p.s.i. 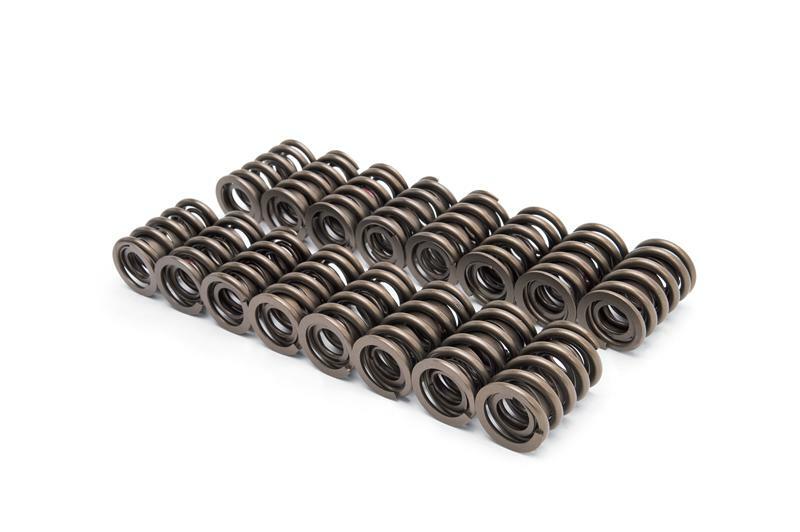 Valve Springs are designed to withstand high spring pressures for high performance applications. This retainer fits the factory “Beehive” valve springs found on GM Gen3 (LS) engines and is designed to work with the factory 7 deg. locks with the stock 8mm valves. This retainer comes standard on the Edelbrock #61969 and works with Edelbrock # 5768 Valve Springs and Edelbrock #9657 Valve Stem Locks. The O.D. of the retainer = 1.00”.